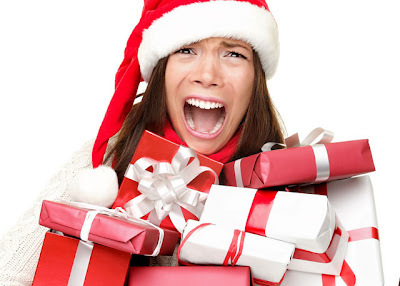 Has it officially set in at your house--- you know, the "Holiday Crazies"?? Back-to-back parties, multiple Santa events, gifts to buy, elves to hide.... it's a lot of fun things, all crammed into a very small amount of time. Are you feeling it? That twitch in your eye? The never-ending 'to do' list? It kind of feels like you are riding a run-away train. I made this cake for my Dad's birthday. It's a pretty cake don't you think? :) I had a lot going on that weekend. It was the day after a big Thanksgiving. We had family in town, we were throwing a baby shower the next day, and there seemed to be a million things going on at once. But since it was his birthday, I was determined to make my dear old Dad a home-made German Chocolate cake. I went to the grocery store and could not find the right kind of chocolate. I kept back-tracking through the store because I felt like I couldn't get my mind to focus on the simple task of grocery shopping. Ok no problem, I finally decided I would just use a box mix and then make the icing from scratch. Then it would at least taste 'semi-home made'. I was half-way back to my house, when I realized I had forgotten eggs. Of course, the main thing that I went to the store for, I forget. Ok no problem, I ran to Walgreens and bought some over-priced eggs. Back in my kitchen, I downed a big cup of coffee and set to work. I baked the cake and set it to cool. Then I worked on the icing. 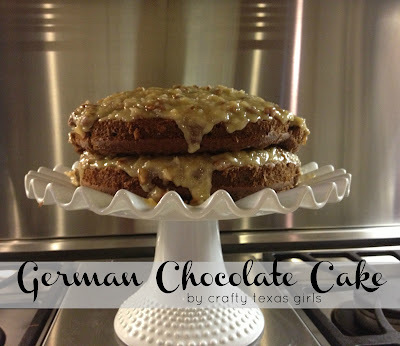 Have you ever made a German Chocolate cake? It takes three eggs for the cake, then three more for the icing. The icing is made on the stove-top, a little high-matinentce but totally worth it. Finally I was ready to assemble the cake. I put everything together on my prettiest cake plate. I couldn't help but smile. I had done it-- despite my scattered brain and all, I had made a beautiful cake. I mean really, it was SO good. I took a picture. I turned around to cross 'make the cake' off my list. And give myself a pat on the back. Then I turned back and saw this. Ok-no problem???!!! I began sweating. My cake was broken in 2 pieces and despite my pushing and begging, I could not get it back together. I pleaded with the cake, stuck toothpicks in the side, and shed a few tears. Panic mode had set in. I had to hide this crack! I decided to make another batch of icing. Three more eggs (if you are counting, this cake was now up to 9 eggs! Is that even safe??) and went back to the stove. I poured the new icing on top of my damaged cake, trying despereately to hide the crack. It really didn't help. At ALL. My Dad arrived about 5 minutes later. I wanted to take my cake and disappear into a closet. No one really cared that is wasn't perfect. After my Holiday crazies tried to take over in November, I decided to fight back. I refuse to let my Christmas go by in a blur of sugar and stress. So far December has been better. I am saying 'no thank you' to lots of events. I am reminding myself that all those things are not 'life or death'. I am determined not to be a 'To-Do List Mom'. My kids, my family--nobody cares about perfect. It's okay for things (and people) to have cracks. Christmas is a beautiful time of year. So this weekend, as you prepare to 'get things done'. Don't forget to love on your family, eat some ugly cake, and just enjoy the moment. Christmas only comes once a year. Sometimes there are cracks in this crazy life. Just roll with it and everything will go well. 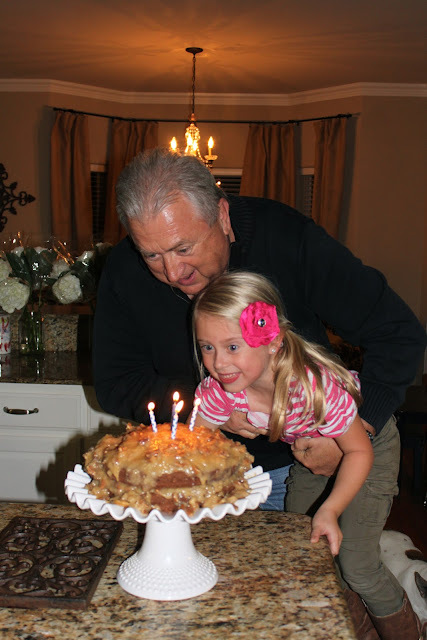 I'm sure your dad loved the cake even with all the cracks. I have so been there! Your cake looks so yummy!!! We put so much stress on ourselves. Good thoughts on a less stress holiday. This year I have done less too just so we can enjoy each other. I have discovered that my family does not want or need perfect, just each other! Happy Holidays!!! I think your cake looks delicious. It's one of my favorites. Here's to all the "cracks" in our lives...have a glass of wine and have a Merry Christmas!!! That cake looks great and I bet tasted even better. As a Professional Chef, I can tell you so many stories like that. But you know what I noticed about that cake the most? Was your heart! That is always the best ingredient! 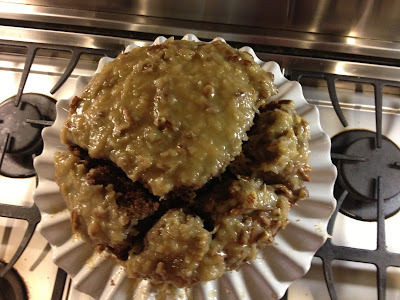 You aren't alone in this type of cake disaster. 2 years ago I made a castle cake for my daughter Afton's b-day. It had lovely turrets made out of ice cream cones. While out of the room opening presents, the turrets fell over taking each corner of the cake with them. Literally, I served the RUINS of as castle instead of the princess palace my daughter had hoped for. Luckily, it still tasted very good - as I am SURE yours did too! We all have been in your shoes! I remember one baking episode where I tried to hold my falling cake together with toothpicks!! Sometimes I feel like my entire life is a crack and any moment I am going to fall in ;) I totally feel your pain! But your cake looks so yummy that my mouth is watering, so it was a success after all! Happy Holidays, friend! Oh it looks so yummy! When my cakes don't cooperate, I use them to make a trifle. Then you just pretend that was the original plan or admit it, and dig in!